Because Vince is 3 years old now, I thought that I change his milk from lactum to nido. 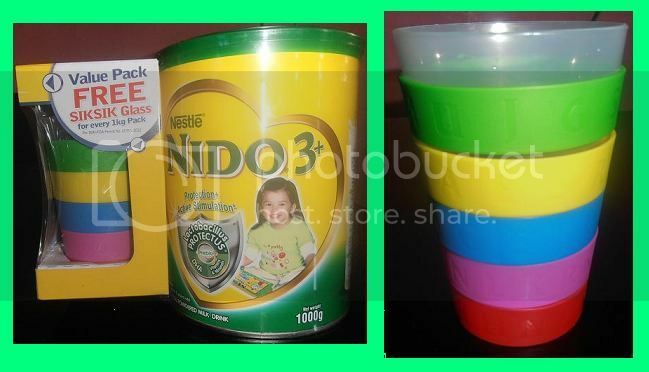 When were in the grocery store I saw the nido 3+ with value pack free sisksik glass. And then I just also bought it for Vince. Nido 3+ contains Prebio³, a unique blend of fibre that helps maintain a regular digestive system. Also contains essential fatty acid, which assists in brain development. It also contains iodine and calcium for good bone development. Vitamins and Minerals : Nido 3+ is a high source of calcium, zinc, vitamins a ,c and e. These are important vitamins and minerals needed by children everyday. DHA: An essential omega 3 fatty acid found in the retina and brain. Prebio: is a unique natural ( Oligosaccharides) dietary fiber. Lactobacillus Protectus: Lice active good microorganisms especially developed by Nestle Research. The Value pack free siksik glass for every 1kg.